Family Volley: Taking Our Stress Out on Our Kids? Taking Our Stress Out on Our Kids? As mothers, it seems we are constantly trying to juggle a million responsibilities. With these responsibilities comes stress, a lot of stress. Enter children, and before we know it, we are taking all our stress out on them. Isn't it interesting, we often treat strangers and coworkers better than our own family. Take a few minutes to figure out what is causing the stress. Are we tired, overwhelmed, money trouble, marriage stress or work stress? Maybe we have just had a long day. Regardless, Stress is going to happen, and we should do all we can to avoid taking it out on our children. They don't understand what we are dealing with and it is not their fault. On top of that, dumping our stress on our children is not the answer either. We don't need to tell them all our woes. They can't fix it, they don't understand it, and at their age, they don't need to be stressed and worried about grown up problems. So.. What can we do? 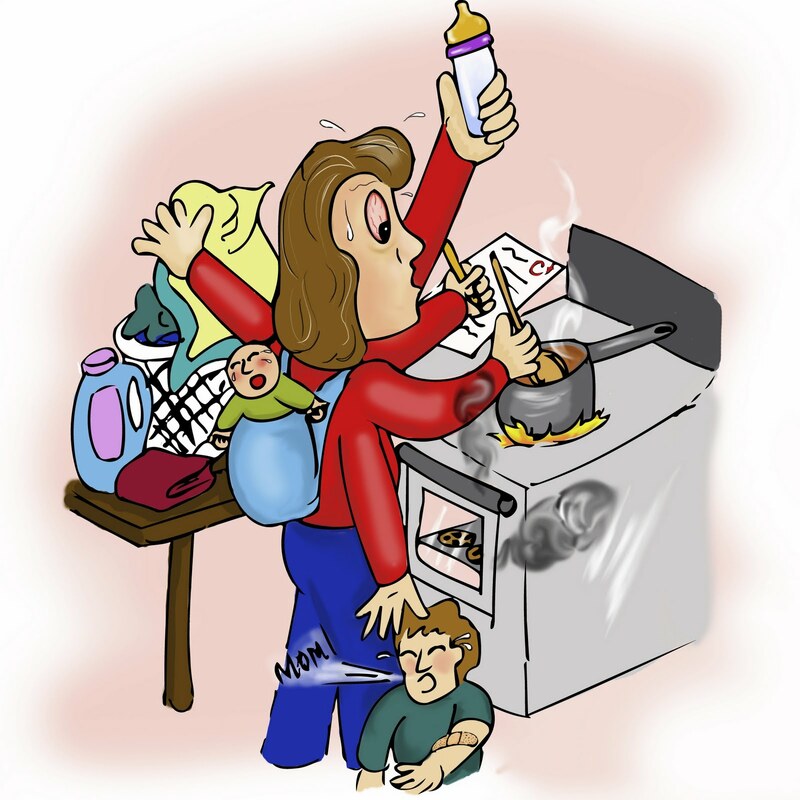 When we have a lot to do, and a lot on our minds, it is easy to think that multitasking is the answer. When we are trying to make dinner, help kids with homework, fold laundry, AND listen to our 5 year old talk about their day, everything else will be more important than what happened at recess. We take our frustrations and stress out on our children because they are making it hard for us to get EVERYTHING ELSE done. The laundry can wait, and so can dinner. Sit down with your child. Give them your undivided attention and focus on their words and their facial expressions. Not only will it bring you closer, but we won't see them as a stress, we will see them as the children we love more than anything. Remember LOVE is spelled T-I-M-E.
We need to put our families and children on a routine. With a routine, we will know what to expect and so will our children. This will eliminate a lot of stress that comes from the unknown and from struggles with bed time and meal time. Our children will be better behaved when things are predictable. This mean less stress triggers for us as mothers. Minimize the stuff in our homes. When we have more than we can maintain, even if it is just too many clothes, everything becomes overwhelming and stressful. We will quickly take our stress out on our children. Work to make the spaces in our lives manageable. Give away, throw out, and get rid of. The clutter in our homes and cars becomes overwhelming and makes the other stresses seem even worse. We shouldn't over schedule ourselves or our children. To many things on our family plates will always bring stress. Our kids don't need to be involved in a million extra curricular activities, and we don't have to say yes to every play date and activity. We need to PROTECT our families time. This protection will bring peace and time together. Plus there will be less rushing. Rushing compounds stress. We don't have to be super women. And, we SHOULD NOT COMPARE OURSELVES TO OTHER MOMS. We need to be realistic about what we can tackle and undertake. When we start comparing we tend to see everyone else's strengths and our weaknesses. It is never a fair comparison. We should surround ourselves with people and things that are supportive and uplifting. Not things that make us feel inadequate. As mothers, we need to take a minute to see things from our children's perspectives. Have empathy. Realize they don't mean to upset us. They are young, learning, and inquisitive. They don't know rush, hurry, or quick. If we can take just a second and see things from their eyes, we will not be so quick to take our frustrations out on them. When we are stressed, it is easy to see our children as objects. Objects that are keeping us from what we are trying to do. We are trying to make dinner, or answer the phone, or fold the laundry and their need for help or attention is getting in the way. We need to see them as people. Little people. They have thoughts and hopes and dreams and good days and bad days just like us. It is the laundry that is actually getting in the way of us being with our kids, Right? Clique, I know, but vital. Time management is so important to our lives. We do need to stay organized and manage our responsibilities and the time it takes to get things done. This goes right along with managing our time. Being prepared and planning ahead will help eliminate a lot of our family stress. Make lunches for school the night before, lay out clothes the night before, even set the breakfast table before you go to bed each night. Round up backpacks and school work, shoes and socks before everyone goes to sleep. Make reasonable preparations to eliminate having to rush. Rushing brings stress, especially with children. Laugh. When you are ready to loose your temper with your children because you are stressed, laugh first. Even if you have to force yourself. You will find it fixes a lot of things. As mother's we are always taking care of other people. We forget to take care of ourselves. We should pick one or two things we would like to learn or get better at, hobbies or interest, and find time for them. Along with this, we need to eat right, exercise, even if it is just a walk around the block, and get enough sleep. When we are hungry and tired we loose our temper and take our frustrations out on our kids. We have to find time to recreate and relax together as a family. Life needs to be filled with work and play. When families play together they grow closer, develop stronger relationships, and have more patience for one another. Plus it is a needed diversion from the stress we deal with each day. Find time at least once a week to do something fun together (this doesn't mean it has to cost money). Stress is part of life. Taking it out on our kids doesn't have to be. DO YOU EVER CATCH YOURSELF TAKING YOUR STRESS OUT ON YOUR KIDS? Unfortunately, I catch myself taking my stress out on my kids more often then I'd like. Now that they are a little older (7 and 8) I've learned, in those moments when it's really bad, to just tell them, "Guys, mommy needs a few minutes" and I'll either go in my room and shut the door or make them leave so I can finish what I have to do. I've even used the phrase "mommy's gonna blow" a few times. It seems to help us all, me to admit it and them to hear me say it! Sorta Southern Single Mom, your right. It really does help when we can recognize that we are stressed, before we take it out on our children. Then we can take a minute to regroup and think things through before we "loose it." Great advice! I love all the tips, it's easy to get caught up in everyday stresses and forget what's really important. Thanks for the reminder! I just posted this to my FB page.. I "preach" what you just wrote all the time! I notice that some of my friends want too much "me time" (they spend hours upon hours shopping, at the spa, lunch etc... whatever gets them away from the house) and when they don't get as much as they want, take it out on the kids. Not fair. Makes me think they should never have been parents in the first place. JDaniel's three year old year may be filled with a number of forced laughs. I love having a schedule. Amber and Steph, I totally agree, reminders help all of us. We can quickly get so caught up with everything else, that we forget how precious our little ones really are. Pretty, I agree. It is hard to be a good mom when we are being selfish. JDaniel4's Mom, I am laughing out loud. We all have those "years". Rach, so sorry to hear you had to listen to negative comments about choosing to be a stay at home mom. Argh, those conversations can hurt in so many ways. The frustration stays with us, long after the conversation ends. It can be so easy to take it out on those we love. They are the ones around us all the time. I totally needed this!!! I have been so stressed out and my kids definitely get the blunt end of it. :/ Thank you. Totally what I needed to hear. this is a GREAT post, lady! i was just talking to my mom about this today. pizza soon, or just hang out soon. you ladies are awesome. i'm loving your blog. i am going to go stalk some more. I should have done things differently! I needed to read this today! Seriously? Where have you been all my life!?!? I found your blog from your post on the Idea Room, and I'm hooked! Thanks for all your fabulous advice. This is just what I needed today, and I felt like it made me a better mom. Thank you! !